I came across a video of you admonishing students in your State who came to you in frustration seeking a solution to the lingering crises in their school, which has been shut for the past eight months. Sir, I am baffled by your behaviour as you castigated them for daring to speak out and being impatient with what seems to be the slow pace of resolution to the matter. This, Sir, is unbecoming of a Governor. Your rhetoric is most unhelpful. Your advice that the students do their worse and threatening to deal with them if they dared you will not address their palpable and urgent concerns. Can you not understand why some students won’t have fear for constituted authority? Your video has gone viral and everyone is now aware of the embarrassing situation in your State. People have seen your disregard for young people and disinterest in resolving the educational crisis in your State. Seemingly, you believe you can be absolved of your responsibility because, in your words, “you didn’t create the problem in the first place.” May I remind you that this is your duty Sir? Your sentiments mirror the sad reality of things in our country – the government’s scant regard for accountability and good governance, and its insensitivity in dealing with pressing and urgent matters affecting the future leaders of our country. It also highlights our failing educational system, the political idiocy that worsens the situation. Sadly, these students are trapped in the middle of a crisis with no one looking out for them, not even the government they fought so hard to elect. You see Sir, the problems facing youths in our country did not start today. It has worsened with successive governments, year to year and from one corner of the country to the other. Our country’s youths have been taken for granted for too long, they have been exploited from all angles. They have been burdened to believe they are “leaders of tomorrow” even though there are hardly any opportunities provided to them to achieve their fullest potential, to achieve their goals and to contribute to our country’s development. I believe in clear conscience, you will admit this is such a shameful situation. I agree that youths in our country have a role to play in its development and I admit that we sometimes ignore the opportunity when presented and this can be attributed in many cases to lack of meaningful leadership. 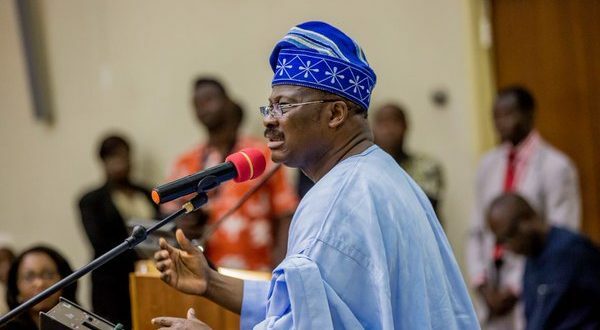 It is imperative for leaders like yourself to understand the importance and value of education in our society and the opportunity that open dialogue presents for solving difficult situations like the one in Oyo. We cannot continue to ignore young people—even if they appear boisterous. Our country’s future depends on them and for that future to succeed, it is prudent that we invest in their education and empowerment. It will be remiss of me if I fail to commend you for what you have done for your state in other aspects. I commend you for your efforts thus far towards free vocational training in Oyo. I encourage you to deal with the situation in your state as a true leader of the people. I hope we get to see viral videos of youth empowerment programs in your state and not the shameful video now going around. I urge you to take the step and leadership in encouraging youth involvement and participation in decision-making processes that affect their lives and their future. Listen to the students; it would be foolhardy to do otherwise.